The Lehigh Valley IronPigs are making a pitch for LeBron James to play baseball instead of signing with another NBA team this summer. With the Sixers officially eliminated from the playoffs, the team will be transitioning into an NBA offseason that, once again, will be dominated by one name: LeBron James. The Sixers are already considered among the favorites to potentially lure the superstar free agent to-be away from the Cavaliers, and one local business has tried to woo LeBron with billboards in Cleveland, a move the King called "flattering." 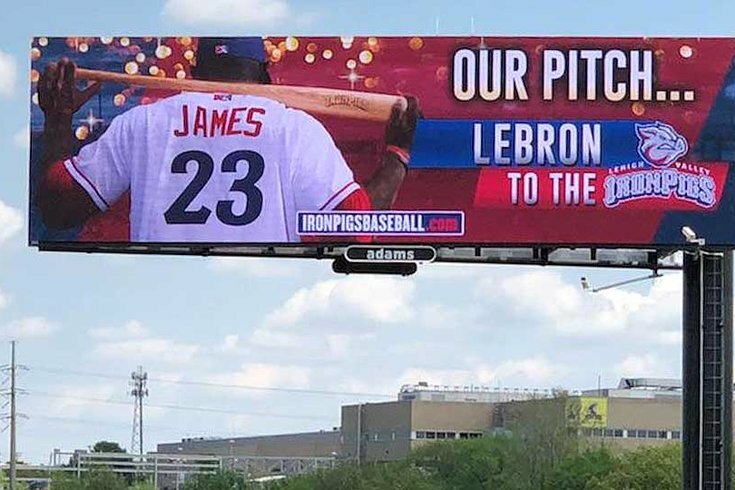 Cleveland countered with a billboard of their own, but the Sixers' newest competitor for James' services is an unlikely suitor: The Phillies' Triple-A minor league affiliate, the Lehigh Valley IronPigs. Another new billboard, which has gone up over the American Parkway Bridge in downtown Allentown, asks LeBron to consider a season playing minor league baseball in Bacon, USA. Hey, laugh all you want, but don't forget Michael Jordan spent a season in Double-A before coming back to win three more NBA championships. One season at Coca-Cola Park followed by three titles for the Sixers doesn't sound so bad, does it?